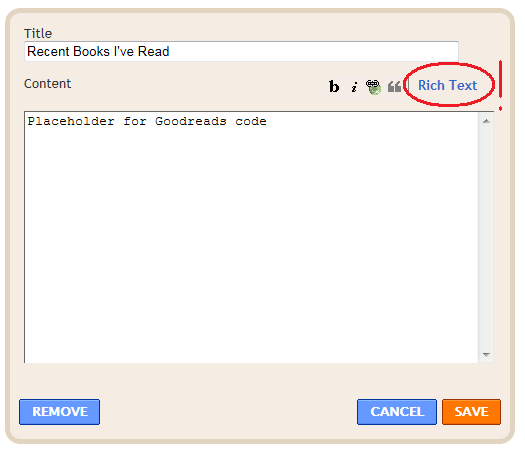 If you love reading as much as I do, then keeping track and sharing your reading list on Goodreads.com is a must! 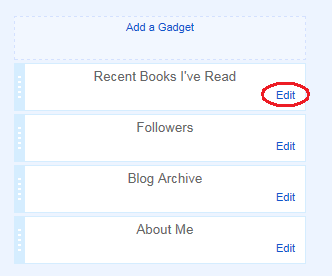 A great place to add your widget is to your Blogger layout. 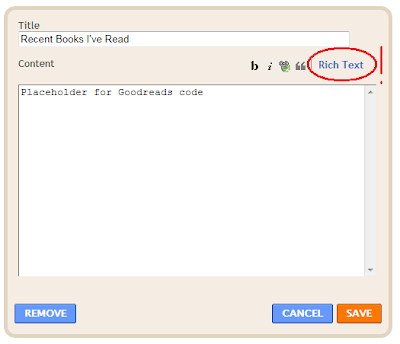 If you haven't experienced Goodreads yet - just think of it as a social networking sites for avid readers (like myself) who want to share and rate what they've read. I find it personally much more enjoyable than Amazon reviews. Anyway, since you landed here I assume you're trying to add the Goodreads widget to your Blogger blog. 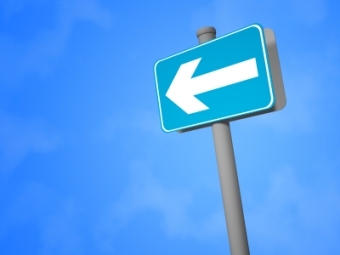 Let's look at how to do this. The placeholder widget will now be in your layout template. 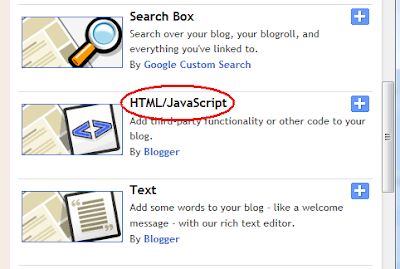 Leave Blogger open for now and start another browser session or new tab in your current web browswer. 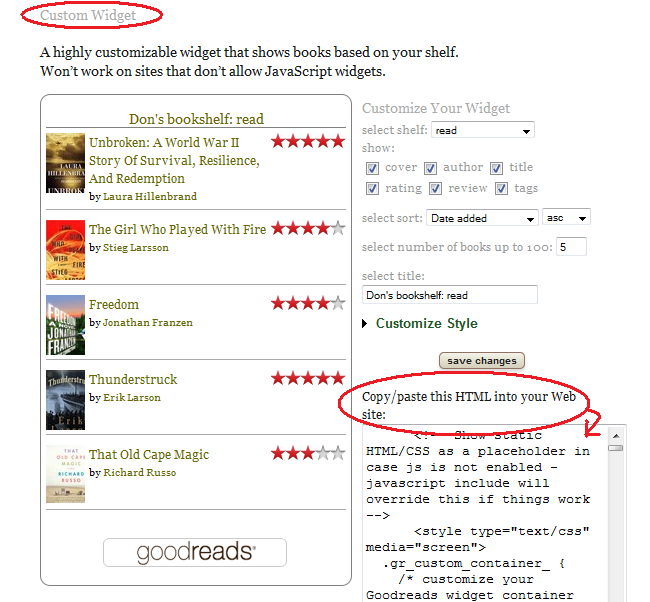 You're now ready to go get the widget code from Goodreads.com. 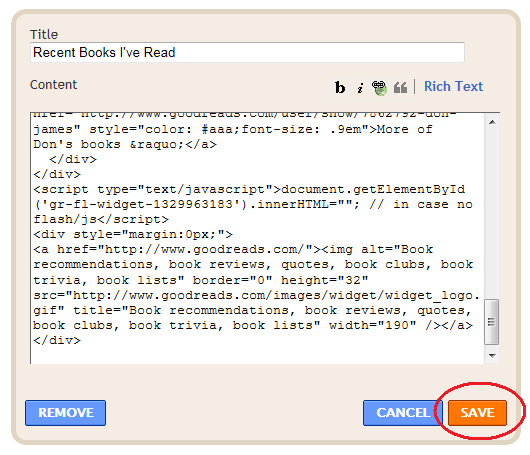 Go ahead and paste your Goodreads widget code directly into the 'Content' window and then press 'Save'. If all goes well you shouldn't see any errors. 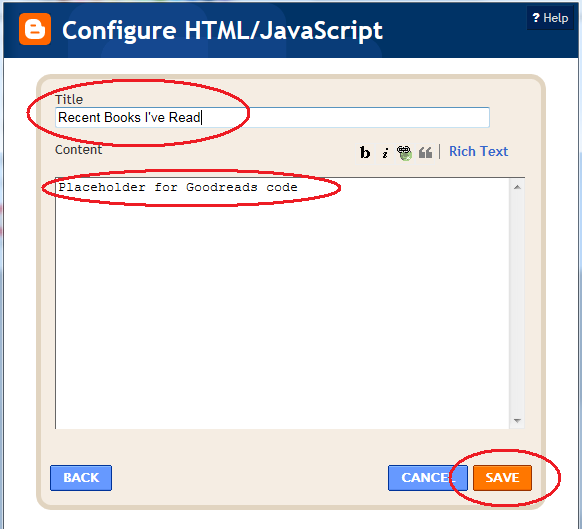 If you do make a mistake just go back to Goodreads and copy the code again. Thank you :) I did it!!! 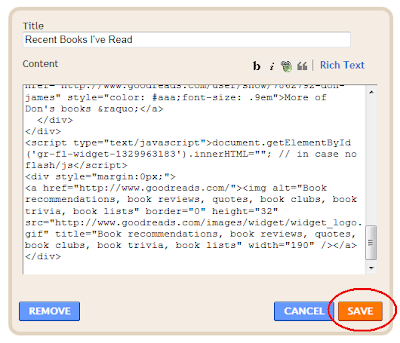 I've done this, but I have a problem with the widget producing an unwanted (and ugly) title line, which is just the computer variable name of my Goodreads bookshelf, above my list of books. 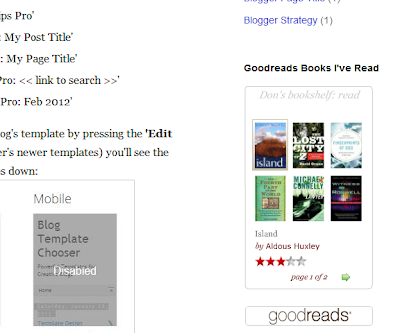 I took a look at your blog - can you just remove the Blogger widget title and let the Goodreads title line work instead? Whew.. that was great. I'd been struggling with this for ages. Awesome widgets! Keep it up.. I feel like a moron now, lol, but thank you so much! Thanks so much for this- You make things that I find scary, actually very easy! The widget is on my blog, but not the books I've read. Any suggestions? 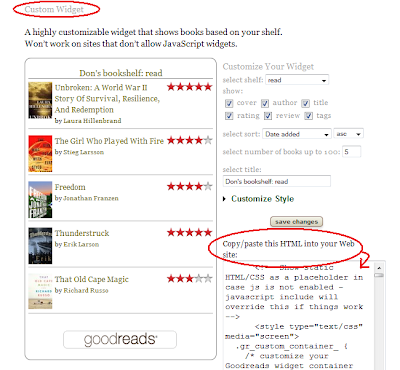 As long as you've logged into Goodreads and created the widget code from your account you should see your books. Try that again to make sure you're logged in. 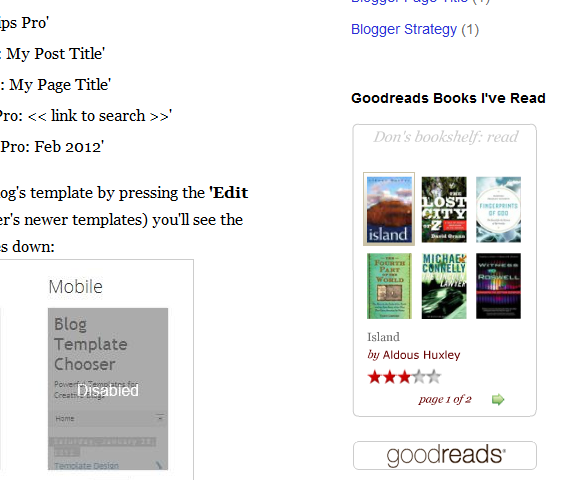 I'm using the grid widget which essentially works the same way and all works well as a static page on my blog. 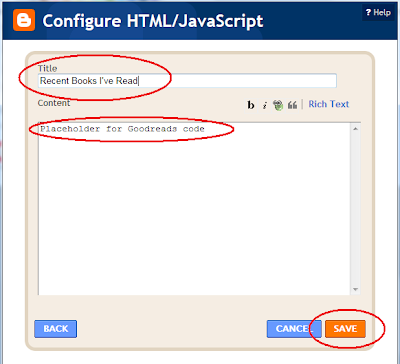 Just a quick question, do you know whether the Goodreads widgets automatically update or whether each time you change/add/reorder your lists, you have to re-copy and paste the code? Also, I realise this blog post isn't specifically about the grid widget but you might happen to know; I'd also like to centre each book image inside the book container. I've tried the align property but that doesn't work so if you had any thoughts. 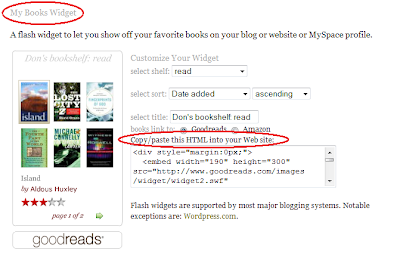 Yes, the widget should automatically update each time you add a book in Goodreads. As for the centering - I took a look and couldn't find where you were referring to the container. Great, thanks! Oh not to worry about the centering in the container; it's just a minor thing and I'm mostly happy with the way it looks at the moment. Glad it helped you out, Paul! 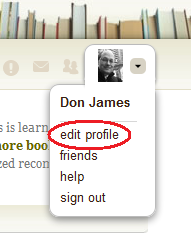 Don, I saw a personalized Goodreads widget on a website that read: Join (name) on goodreads" with the goodreads "g" below that. Can you tell me where I can get code for something like that? No, I'm sorry - I haven't seen that - but can take a look. I did this for the GoodReads challenge and I'm having a problem. The challenge shows up twice on my blog and there is this ugly blank box above it. Can you help me out? Nevermind! I figured it all out! Thanks for this post by the way, it was very helpful! 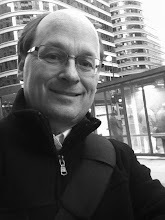 Thanks for guiding me, i am looking to add this widget to my blog.